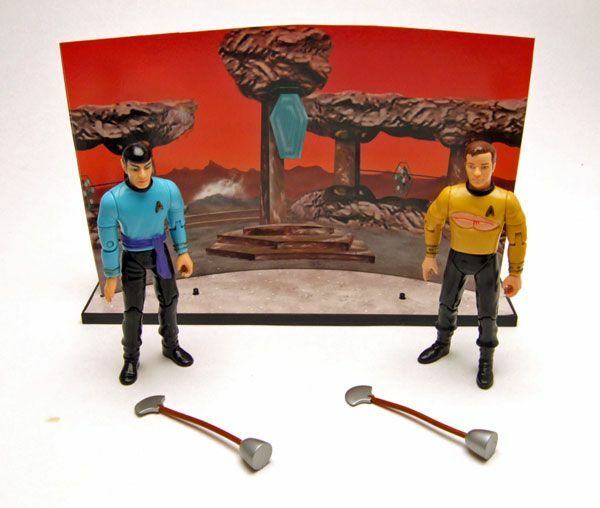 Playmates released this "Amok Time" set as a New Force Comics exclusive. Sigh. 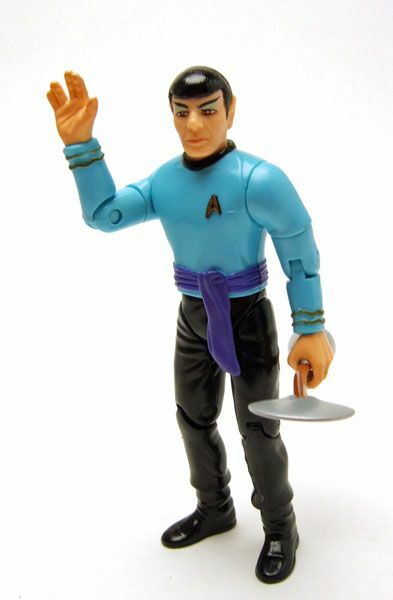 Let's get this out of the way- Spock is yet again stuck with the Vulcan salute hand. If there's one pack that needed a new hand, it was this one. 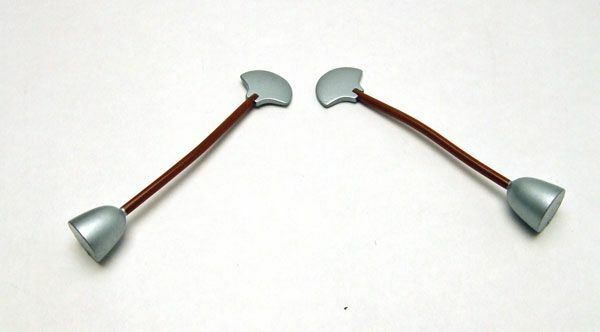 I seem to remember Rick over at New Force trying to get a new hand, but the tooling cost just didn't work out (I could be wrong about that...it's been 10 years since this pack was released). 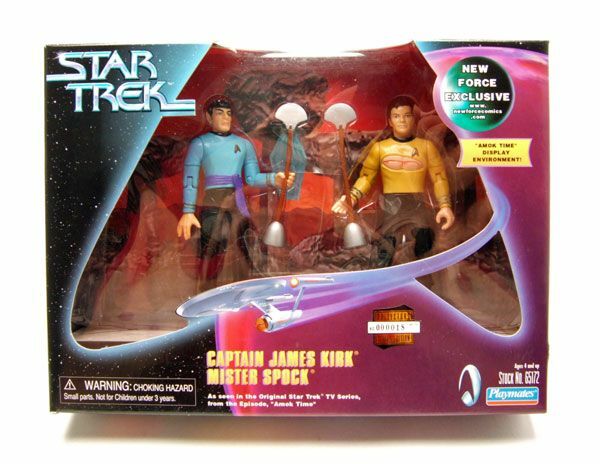 I guess you can just say that this figure is based on Spock from the end of the scene where Spock flashes the salute. 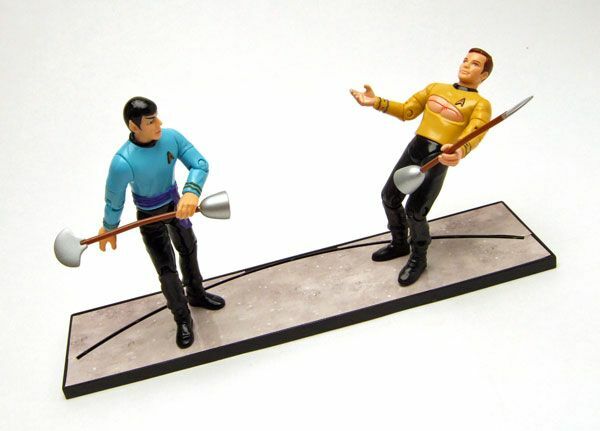 The real problem is that Spock has trouble holding his lirpa due to the fact that he can only use one hand and the grip isn't tight enough to hold it. Bummer. 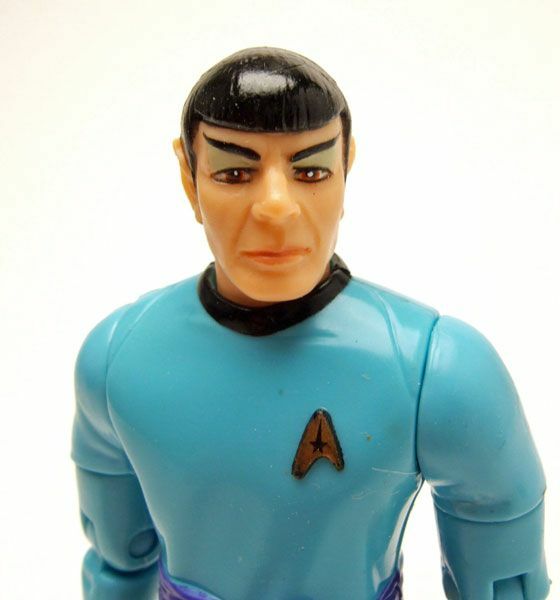 The figure is mostly a reuse of the classic crew set Spock. You get the same great head sculpt here that you got there. It's one of Playmates best efforts in this scale. The only new portion of the figure is the chest. 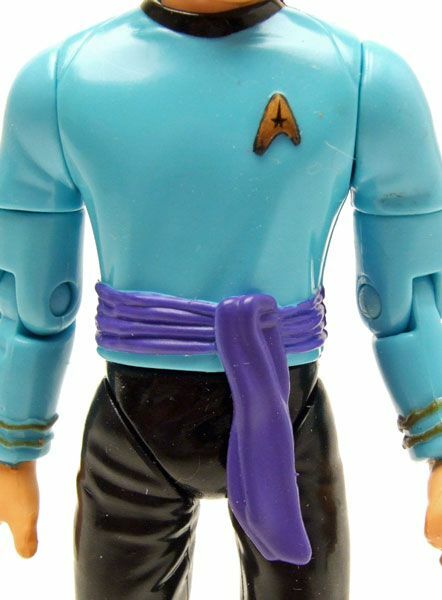 Playmates tweaked the mold here to give Spock his purple sash. *Check it out! Playmates gave him the command symbol instead of the sciences! Oops! Thanks to my buddy Kor'Tar for pointing this out! Then there's Kirk. Kirk also has trouble holding his lirpa due to the hands having loose grips. It's a bit of a nuisance, but nothing a little sticky-tack can't solve. 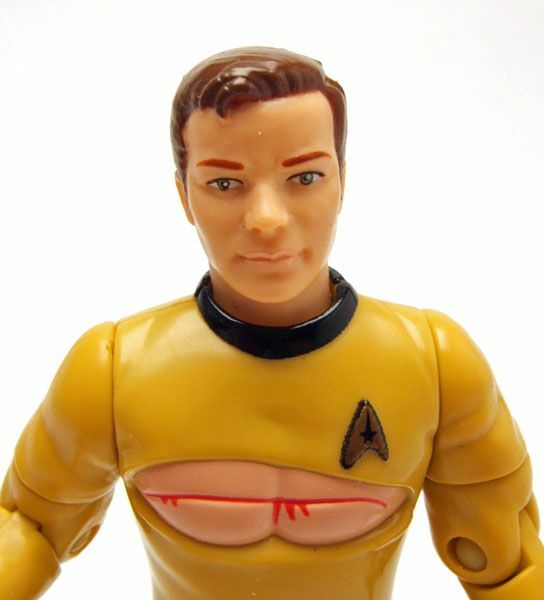 And also just like Spock, Playmates changed the chest mold to reflect the episode. 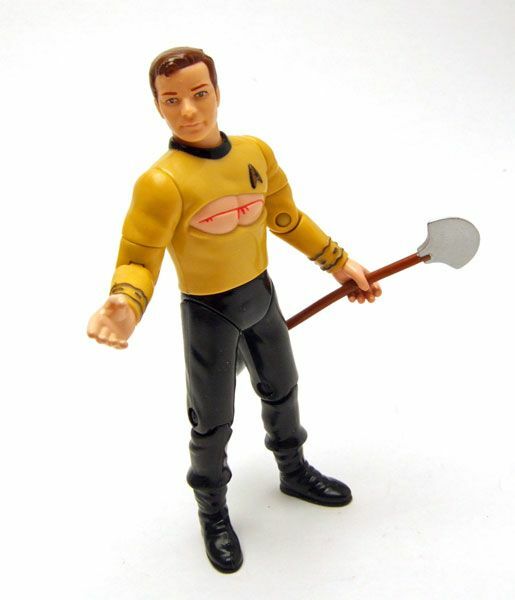 Kirk has the nasty cut Spock inflicted with his lirpa. That detail really makes this figure the gem of the set. 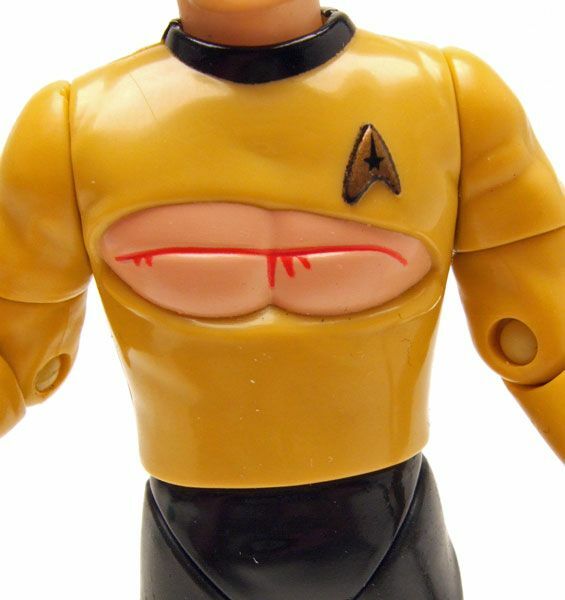 Everybody needs a battle-damaged Kirk! 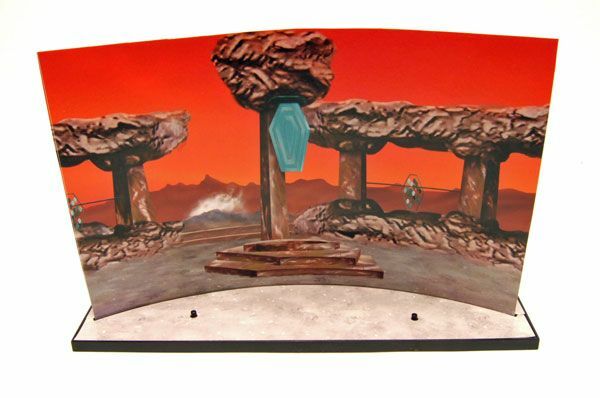 Like the rest of these multi-packs, the set comes with a stand and a cardboard backdrop for you to cut out. Looks really sharp! 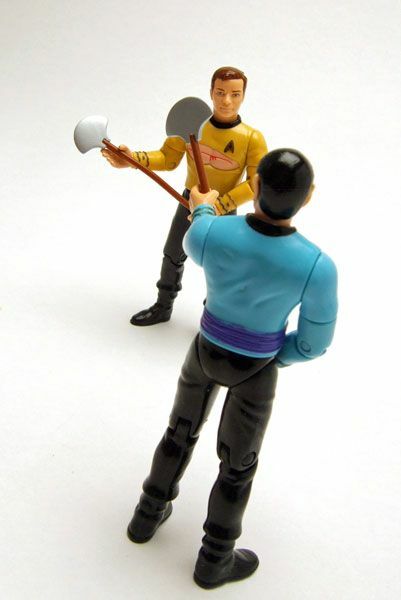 Accessories: Both Kirk and Spock come with a lirpa. As I mentioned, they can't hold them all that well without some assistance. New Force Comics actually still has a few of these left in stock. Price is $29.99, and you can find it here. The price may seem a little high, but you have to remember that this was an exclusive available only through them at a time where Target exclusives ranged for $20-$30... so $30 isn't too bad for a smaller retailer. 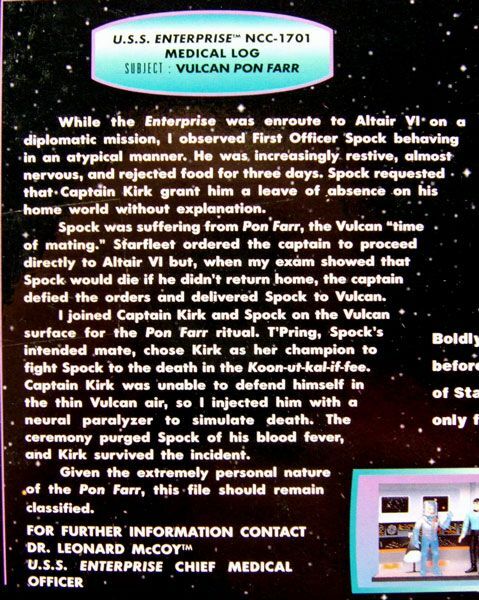 I just noticed while looking at the pics of spock , that Playmates gave him a Command division badge instead of the accurate Science division badge . Thanks for pointing that out! I totally missed it! 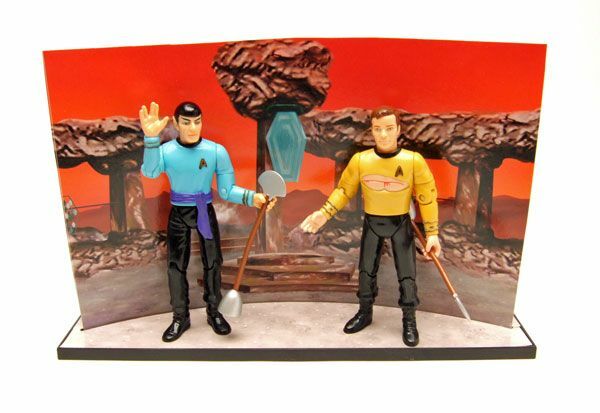 Wasn't this the very last TOS item Playmates produced?